Fox Harbour Air Station (ADC ID: N-27C) was a General Surveillance Gap Filler Radar station in the Canadian province of Newfoundland and Labrador, It was located 210 miles (340 km) southeast of CFB Goose Bay. It was closed in 1961. The site was established in 1957 as a manned Gap Filler radar station, built by the United States Air Force, under operational control of Cartwright Air Station and part of the Pinetree Line of Ground-Control Intercept (GCI) radar sites. The station was assigned to Aerospace Defense Command in 1957, and was given designation "N-27C". 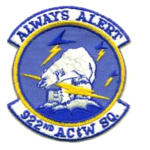 Aerospace Defense Command stationed the 922d Aircraft Control and Warning Squadron at the station in 1957. It operated an AN/FPS-14 manned Gap Filler search radar. Winkler, David F. (1997) Searching the skies: the legacy of the United States Cold War defense radar program. Prepared for United States Air Force Headquarters Air Combat Command.